A good-looking headache rack polished to brilliant perfection can make any tractor look like a million dollars. After all, what’s more attractive on a truck than lots of clean and polished chrome? That said, headache racks are not really intended to be showpieces. They provide a vital function. Indeed, headache racks save lives. No one is really sure where the term ‘headache rack’ comes from. Some say it is so named because it prevents head injuries to flatbed drivers should cargo break loose and slam into the back of the tractor. Others say the name comes from the tendency of truck drivers to hit their heads on the racks when hooking and unhooking trailers. Regardless of the origins of the name, the point of the headache rack is to protect the back of the tractor from shifting cargo. 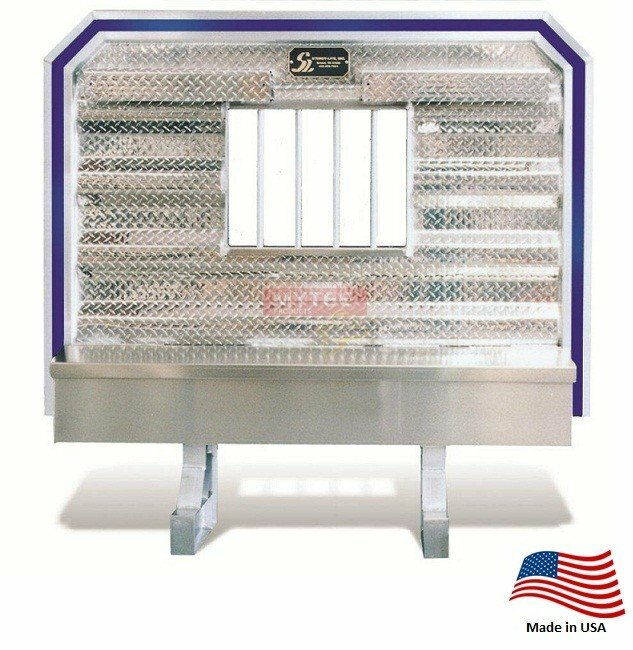 A headache rack can be nothing more than a steel plate welded to the frame of the truck in just the right position. However, it can also be much more. Headache racks can include cabinets and hooks that increase a tractor’s storage capacity. Neither federal nor state law requires tractors to be fitted with headache racks. Drivers are free to use trailer bulkheads or extra tiedown straps to secure cargo in the absence of a headache rack. Still, a headache rack is a very good idea for any tractor the tows flatbed trailers. Take the 2014 case of a truck carrying steel girders through Tualatin, Oregon. The truck was cut off by another tractor-trailer, forcing the driver to slam on the brakes. At that very moment, he heard the sound of screeching metal. Knowing what was about to happen, the driver ducked down and hoped he would live to tell the story. Thankfully, he did. A steel girder crashed through the right side of the cab, missing the driver by mere inches. The truck was not equipped with a headache rack. For that driver, death was just inches away; just a few inches to the left side and that would have been it. One of the best things about headache racks is that there is one for every truck. The racks Mytee Products sells are standard sizes and can be fitted to almost any tractor. But even if none of the models work for your truck, you’re not out of luck. You could have a custom headache rack built just for your rig. You could buy one of our racks and have it modified to meet your needs. Here’s something else to consider: not all headache racks are designed only to protect the back of the truck. There are cab-over models that can protect the occupants in the event of a rollover. You don’t see these kinds of headache racks on tractor trailers, but they are common for utility vehicles. A case in point is a truck operated by firefighters fighting a blaze in Colorado earlier this year. The truck was essentially a heavy-duty pickup truck with specialized equipment mounted on the back. Its headache rack covered both the back of the cab and the top of the truck. While traveling a mountain road thick with smoke, one of the front tires left the roadway and sent the truck plunging down a ravine. Though the vehicle was all but totaled, both driver and passengers walked away from the accident with only minor scrapes, scratches, and bruises. Headache racks sure do look fine when cleaned and polished. But they also save lives. Which is more important in the long run?